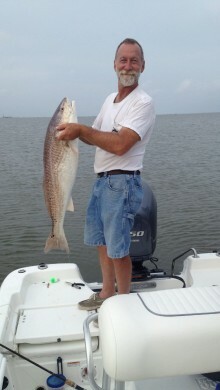 Bayou Country Charters is a New Orleans Fishing Guide Service that Specializes in catching Redfish & Speckled Trout. Captain Joel Barras' professional fishing guide service delivers an unforgettable New Orleans charter fishing experience. We’re located in Lafitte, Louisiana just 40 minutes from the New Orleans French Quarter. This means you can be on New Orleans Redfish & Speckled Trout within minutes. We always have a bay boat on hand that will seat 1-5 people and a professional fishing guide that will get you hooked up with fish. Additional boats are available at all times for larger groups. All captains are US Coast Guard licensed, insured and trained in first aid. BEST FISHING RATES ON THE BAYOU! Call 504-881-6016 or Book your trip online! For safety reasons, most of our captains only fish 4 anglers per boat. We have 2 boats that can fish up to 5 Persons. If you have a group of 6 or more people we can accommodate you by using more than one boat. We operate multiple boats each day. We offer morning and afternoon chartered fishing trips. Our morning trips normally depart at safe-light and return by 1–2:00 pm. Our afternoon fishing trips depart 1:30–2:00 pm and return before dark. Times can be modified to meet your schedule. guided fishing trips are normally 6.5–8 hours. Have a question about our New Orleans fishing guide services? Read our FAQs or call us at 504-881-6016. Bayou Country Charters charter captains are very confident that you will catch fish, South Louisiana has some of the best fishing in the country for Redfish, Speckled Trout, Sheephead and Black Drum. It’s our job to put you on fish and that’s what we’re experts at. Deposit amount is $150.00 per boat. Your CATCH cleaned and bagged. Lodging and transportation are available with with our Fishing Vacation Packages – contact us for prices! We can also make arrangements to have your CATCH shipped home to you. Tips are not required but are always appreciated. Full payment of charter is due upon completion of your fishing trip. If you cancel your fishing trip you must contact us, in writing, a minimum of 10 days prior to your scheduled trip to receive a credit. All fishing trips are subject to cancellation by the CAPTAIN due to severe weather conditions. If a trip is cancelled by your captain it will be rescheduled. All cancellations take place prior to leaving the dock. HIGHLY RECOMMENDED! My dad and I (from Colorado) had never fished the bayou, and we couldn't have asked for a better experience. Captain Joel was great and the fishing was even better! This was such a fun experience! Joel was so funny and fantastic to fish with and was a great guide. We limited out within 2 hours and Joel was nice enough for us to continue to fish for other fish for another 5 hours. Amazing venture for an amazing price. Whether you are from Louisiana or else where Bayou Country Chart is the place to go! Great time, second trip I've been on with Joel and he takes great care of us every time. Joel from Bayou Country Charters was super helpful. I contacted him only a few weeks before I was headed to New Orleans and he was already booked. He made several calls to reputable charters and connected me with 3 guys who were very professional and helped us catch lots of fish. We had a great day and caught a bunch of keepers - red fish, speckled trout and sheeps head, which we had cooked locally creole style. Joel followed up with me to make sure everything was going as planned. I would highly recommend Bayou Country Charters. Top Notch! Had a great time with the boys and Captain Joel today! Although the wind was tough he put us on redfish for a limit and picked up a couple catfish, drum and a sheep head. We really appreciate Captain Joel's efforts in tough condition and his jokes. We will be going back for another trip for sure! We highly recommend his charter service. Bayou Country Charters - A Fishing Charter Company in Lafitte, Louisiana. We welcome out of town guests and New Orleans visitors.